Will the heart of Little Tokyo survive and thrive, or be sold off to the highest bidder? First Street North — bordered by First Street, Alameda Street, Judge John Aiso Street, and Temple Street —is home to some of Little Tokyo’s most important and well-known cultural institutions, legacy businesses, and historic sites. Many visitors know the Japanese American National Museum, Far Bar, Fugetsu-Do, Daikokuya, and Anzen Hardware on First Street. Also on this block is the former Nishi Hongwanji Buddhist Temple, which houses the Go For Broke National Education Center, and Union Center for the Arts, headquarters to East West Players, Visual Communications, and Artcore. Over summer 2018, Sustainable Little Tokyo stepped up its MyFSN campaign for community control over the First Street North block, one of three remaining parcels of publicly owned land left in the neighborhood, which is potentially up for redevelopment this year. For a community that remembers being forced into incarceration camps during World War II and is struggling with gentrification, along with neighbors in Boyle Heights right down the street, the identity and vitality of Little Tokyo are at stake. Ongoing high-priced housing construction and development around the Little Tokyo/Arts District Metro stop has also taken a chunk out of the neighborhood and foreshadows uncertain changes. Little Tokyo is one of three remaining historic Japantowns in the United States, and the second-oldest neighborhood in Los Angeles at over 130 years old. In this context, Sustainable Little Tokyo’s goal is to stabilize the community and consolidate local control. As a community-driven initiative, SLT’s vision is a model for locally-controlled development of Little Tokyo. A partnership between the Japanese American Cultural & Community Center, Little Tokyo Community Council, and Little Tokyo Service Center, Sustainable Little Tokyo envisions a First Street North with affordable housing, commercial and office space, ample community and cultural space, an expanded Go For Broke National Education Center visitor facility with permanent supportive housing, and much-needed green space and parks. A big step forward will be securing a land lease agreement for GFBNEC, which Councilmember Jose Huizar actively supports. In September 2018, Sustainable Little Tokyo and Nikkei Progressives delivered over 2,500 “Save First Street North” signatures to Huizar’s office, calling on him to support maintaining local community control and development over the block. 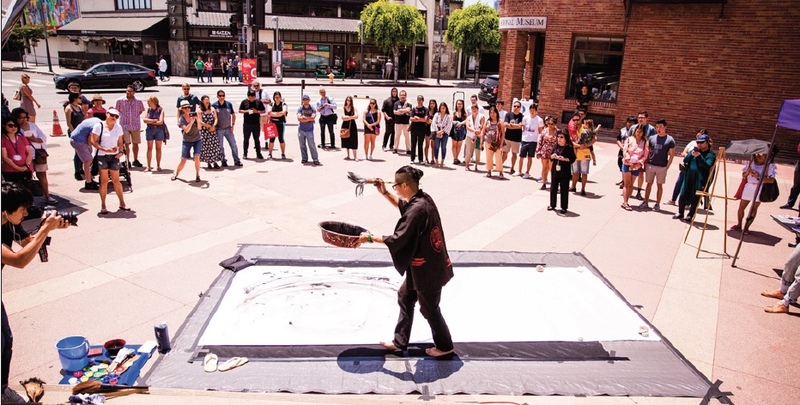 For Sustainable Little Tokyo, another important step is to make its vision for First Street North real through arts and culture: the MyFSN campaign. MyFSN’s first projects included a poster-making contest, placemat artwork, and Bronzeville re-creation. 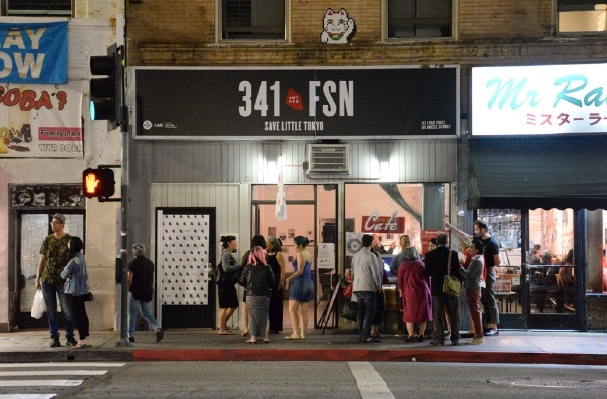 In summer 2018, as part of the MyFSN campaign, LTSC transformed the former Matsumura Gift Shop at 341 E 1st Street into 341FSN, an experimental community space. SLT’s Arts Action Committee then inaugurated [email protected], focused on accessible Japanese American and Asian Pacific Islander American arts and cultural programming. Taking advantage of the usually busy foot traffic on the block, [email protected] filled the previously empty storefront with lively arts, senior, and youth programs. Visitors might have also seen the bright yellow AntenaMóvil mobile bicycle bookstore, featuring small and independent press books. Threaded throughout [email protected] has been an overall awareness-raising campaign to educate the public about the existential threat First Street North faces, and the community’s vision for the future of their historic neighborhood. Several other groups have also shared the space, including LTSC’s +LAB Artist Residency, a Japanese American Women Speak (JAWS) exhibition, small business pop-ups, and a Nikkei Progressives voter registration drive. 2019 is the year First Street North and Little Tokyo could have some key victories that demonstrate what rallying around a united community vision can accomplish. With many communities around the country struggling with the negative impacts of displacement and gentrification, now is the time to make sure First Street North stands out as a big win.